This week our Room by Room series is all about kitchens, and I’ve got a simple summer kitchen tour to share. 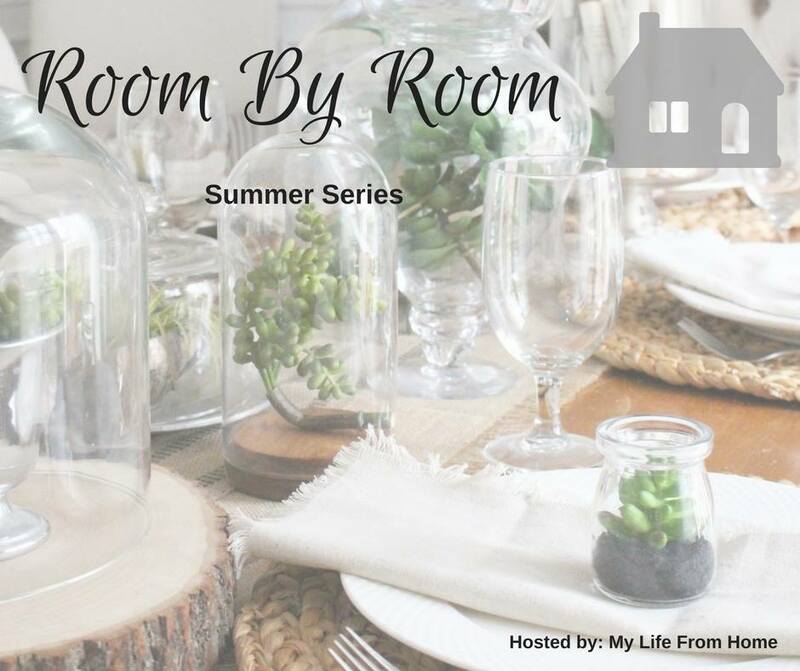 If this is your first time joining our series, each week my friends and I will be sharing a look inside different rooms in our homes. The whole idea is we’ll be sharing our rooms as they are – some are “finished” (are we ever *really* finished decorating?? ), some are works in progress. We’ll be talking about how our families use these spaces, our decorating plans, challenges, etc. 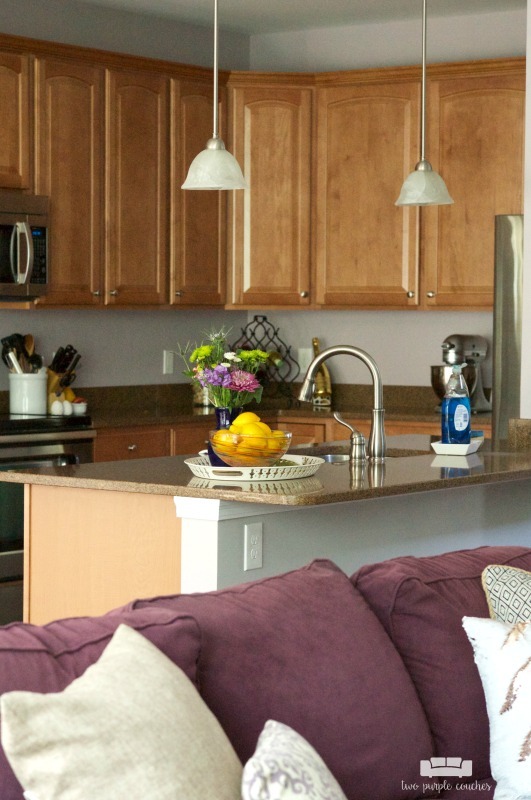 Last week, we shared our entryways and this week we’re moving into our kitchens. Now, I must say before we dive into my summer kitchen tour, this room and our family room are the two spaces in our home that I struggle with the most when it comes to decorating and photography. One of the features that sold us on this floor plan was how open it is. 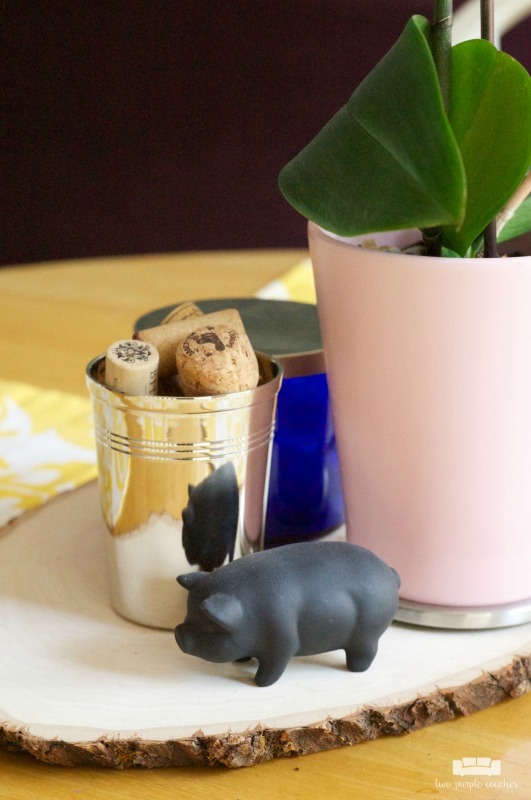 It wasn’t until I started getting really interested in interior decor and blogging that I realized how tricky an open-concept can be to furnish, style and decorate. In five years, I haven’t figured out how to crack it! If you’ve got any tips or suggestions, please leave me a comment! I would love to hear your ideas! But enough of me rambling, let me show you our kitchen and how I’ve freshened a few things up for summer. After you walk through our entry, you come right into our family room/kitchen space, with the kitchen to the right. This space really is the heart of our home, and where we spend the majority of our time. From prepping and eating meals to relaxing on the couch, more often than not, we are often in either our kitchen or family. I bought my husband an Amazon Echo for Christmas and it lives on our kitchen island. (I should say “she” because we always refer to her as ” I use it almost daily to listen to music while I’m working or cooking dinner, and I love that it easily fills the room with sound. Did you know it comes loaded with a daily Jeopardy! game? My husband and I like to test our knowledge and see who can answer first. My favorite features of our kitchen are our large island that overlooks our family room, and the fact that we have tons of cabinets. We also have a walk-in pantry, so we have tons of storage. Which is fantastic, because in the condo we lived in before we built this house—we didn’t have a pantry! Neither one of us realized it until after we moved in, and then we both wondered how to managed to buy a house and not realize the kitchen didn’t have a pantry. So our already-limited cabinet space had to be split between dishes, glasses, utensils and food. Now, we have the opposite problem and have so much space available that we’re tempted to fill it with unnecessary stuff. My least favorite feature of this kitchen is that it’s an interior kitchen. The only part that borders an exterior wall is our eat-in area. Here we have a partial-bay window and a sliding door that leads to our deck. Again, we didn’t think much of this fact while we were in the process of building, but after moving in, we realized that our kitchen is actually quite dark. 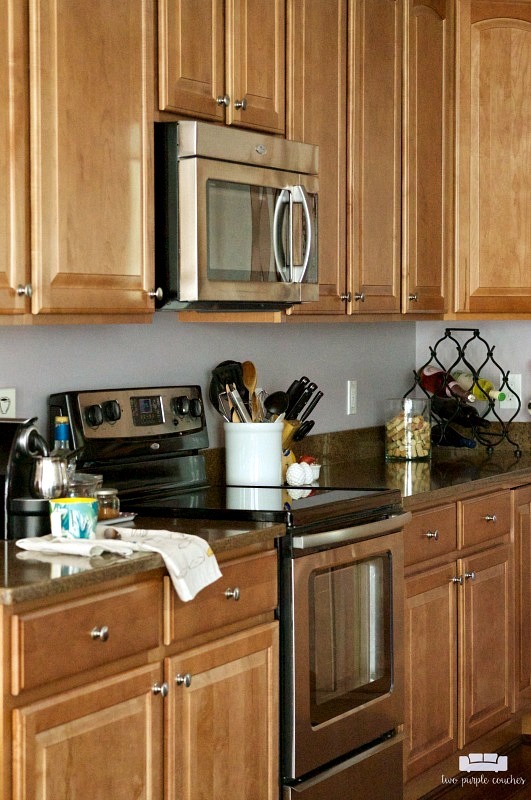 Which is why it’s so tricky to photograph – there’s no natural light bouncing off our cabinets. Plus our maple cabinets and brown countertops make it feel a even darker. I’ve got to be honest, though—I am not a white kitchen kind of girl. I love them in other people’s homes, but I don’t want one for myself. 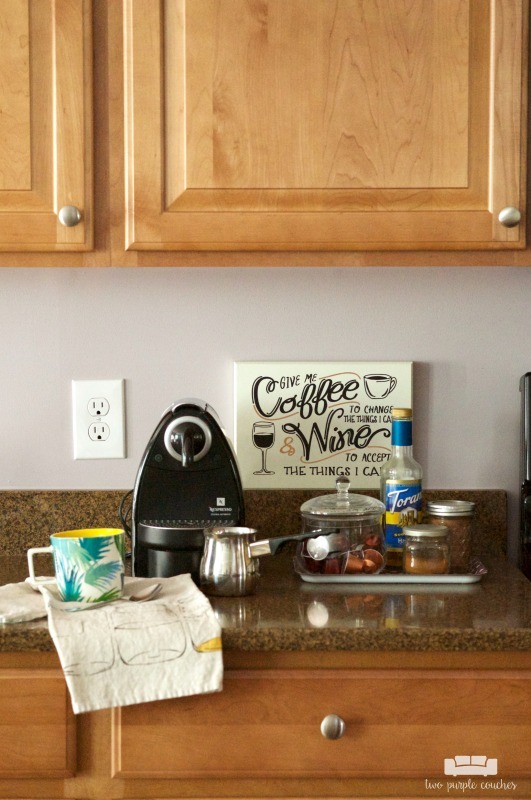 If anything, I wish I’d been able to talk my husband into the super dark espresso cabinets! I loved those! I wrote up a post a little while ago about our countertops, which you can read here. They’re quartz and I love them. We had several options since we were building and ultimately landed on quartz. Five years in, and I’m very happy with that decision! The only thing I might change is choosing a light color instead of the dark. Our kitchen table is a hand-me-down from my parents. It’s not our style at. all. But it’s sturdy and gets the job done. I keep thinking one day I’ll paint it, but I can’t settle on a color. I’d also love to swap out the chairs for ones with cleaner lines. 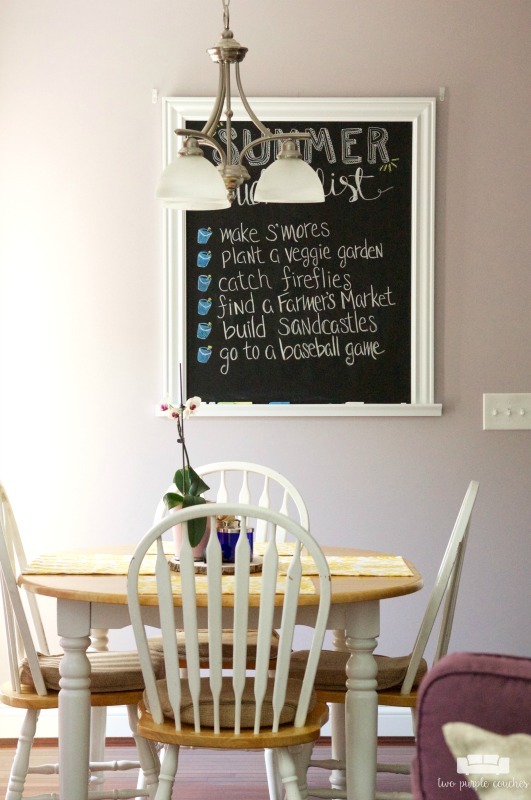 The chalkboard was a DIY we did a last year—you can read about it here—and I created chalkboard art for my Home for Summer e-Book that launched recently. There’s a small hallway off our kitchen that leads to our garage, pantry, a half-bath and also contains a coat closet. 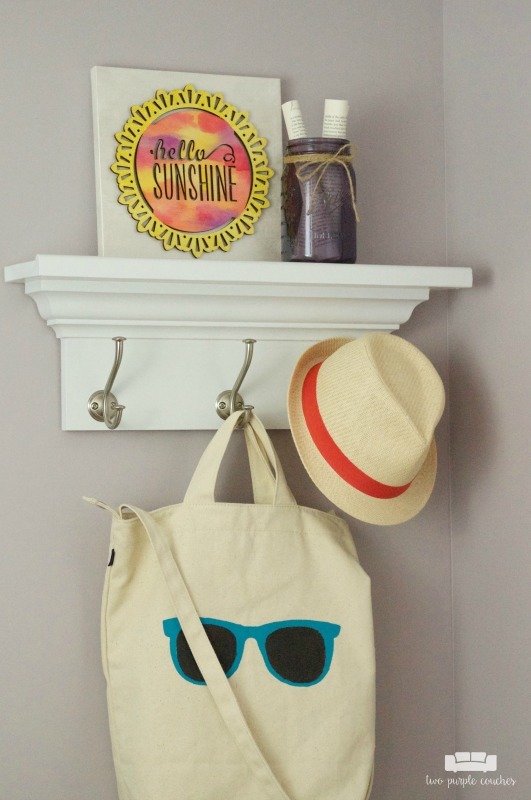 One of the best and simplest DIYs we’ve done was add this wall shelf to the hallway. It’s amazing how a simple shelf to bring style and order to small space! 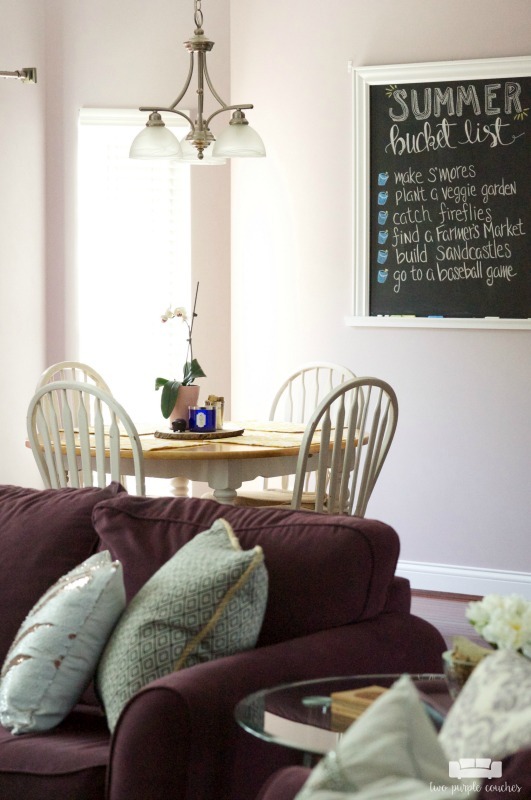 The walls in our kitchen and hallway are painted French Lilac by Behr. Our family room is Natural Grey by Behr. The crazy thing is that in the right (or wrong!) light, they actually look like the same color! Sometimes I wonder if we should paint the kitchen the same color as the family room, but I do like having some distinction between these two spaces. In addition to upgrading our kitchen table at some point, we’d also love to add a backsplash and under-cabinet lighting. We’re kicking ourselves that we didn’t consider under-cabinet lighting while we were building – it would’ve been so much easier to add then versus now! We’ve also talked about eventually upgrading the pendant lights over the island. Thank you to Amy from My Life from Home for coordinating this series! 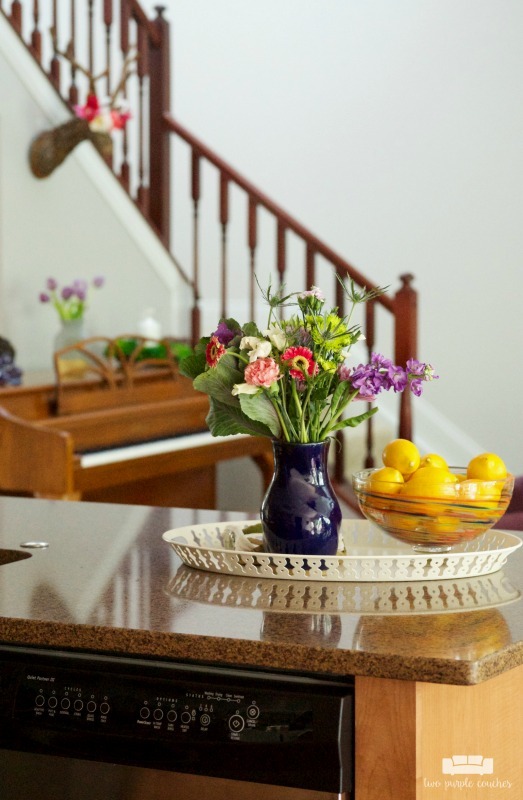 Be sure to check out these other beautiful kitchens, and join us next week as we share our family rooms. This entry was posted in Around the House on July 5, 2017 by Two Purple Couches. That island is so huge and lovely! I am sure you have many great gatherings around there with friends and family 🙂 I’ve been hearing so many great things about quartz – so nice to hear after five years you’re still loving your choice! Yes – this island is perfect for entertaining & it’s always where everyone gathers 🙂 We really do love our quartz countertops; I would choose them all over again! Your kitchen reminds me so much of my beloved kitchen in our first house–it literally sold me on the house and had very similar cabinets! Your kitchen is beautiful and I love the big island! I think you’ve done a great job with the decor! I especially love the tray on the island! Thank you Samantha! Our island was one of the features that sold me on this floor plan; it’s perfect for laying out food for parties! It’s funny how white cabinet seem to have become the norm! I don’t have any plans of getting rid of our maple ones anytime soon – I love them! Your kitchen is such a great size!! I would die for all those cabinets! I love our Echo also!! I do adore all of our cabinet space… though I’ve somehow managed to nearly fill them up in just 5 years! If your brave enough you could make the wall a chalkboard instead of having a small chalkboard that only covers part of the wall. We considered doing a full chalkboard wall, but opted for the framed one so we can change it out more easily if we tire of it down the road. Haha I love that wine and coffee sign!! 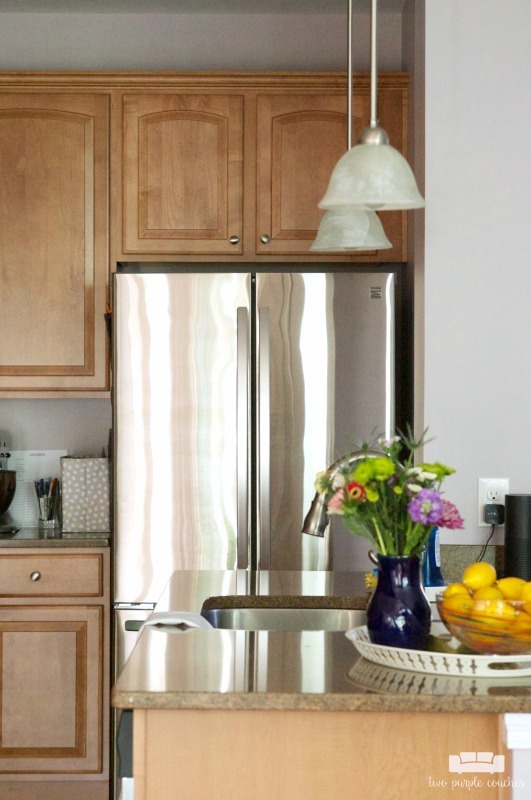 Your island is so big and perfect for your space – and I’m jealous of your big pantry! Your kitchen is great! I actually love your cabinets and I’m a white cabinet kinda girl. 😉 And I’m so jealous that you have a walk-in pantry! Thanks Erin! I have to say our pantry might be one of my favorite features of our house, haha!